Give children opportunities, responsibility and trust in an environment which is stimulating and humane. Teach children what they need to know and show them how to learn for themselves and with others. Build bridges with parents, families and communities, working in partnership with others in the area. All schools are full of values, and everyone who works or learns in a school has their own values in which they believe and by which they operate. Rather than saying “these are Rose Hill Primary School’s values” we prefer to introduce children to a programme of values-based ideas, which the children have a chance to discuss in class and as a whole school. In addition, we are asked by the government to teach British Values, and so we have incorporated these into our values programme. Here at Rose Hill Primary School we also introduce the children to The United Nations Conventions on the Rights of the Child. We know about democracy and we learned about trust in assembly – Y 1 child. Making judgements about the “ethos” of a school is difficult. An ethos cannot really be seen or measured; it is something which can be felt, an inner peace, the stillness supporting the energy. How do you know a school has well behaved children when you cannot witness or police every action of every child? How do we know what children think? How can we fully know the difficulties that some children face? This is why we hold the belief that behaviour is communication: we need to learn to read a child’s behaviour, to support them so that they can grow and become resilient and know how and when to ask for help, rather than masking behaviour in the short term with empty, material rewards. People who visit our school often comment on our ‘ethos’. They refer to children’s behaviour, courtesy, politeness, enthusiasm and eagerness to name but a few qualities. Visitors often leave us feeling energised and wanting to come back to work with our amazing children. Our School Vision helps us to create this ethos. We ensure that all children progress as far and fast as possible, and achieve as much as possible, fulfilling their potential. We build bridges with parents, families and communities, working in partnership with others in the area. We have six core values and these values are then broken down in to related values or ideas. We call these our satellite values. Each half term a core value is reflected upon with the satellite values supporting the over-arching theme. 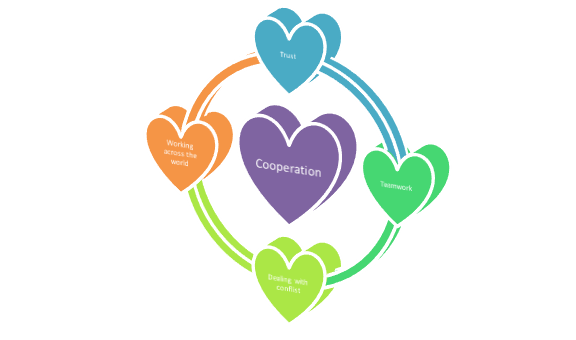 The September Core Value of cooperation is supported by the consolidated values of trust, teamwork, dealing with conflict and working around the world. It is difficult to put a value in an isolated box. As our staff and children discuss and reflect upon a value their own understanding and satellites will be shaped and opportunities to discover how these values are linked is part of their learning. Individuals will make their own links as values a set of beliefs which individuals hold. It might be that something happens in the playground, or in the world, which will enable us to introduce a supporting value. Our approach to values is carefully considered in relation to the age and stage of the children. For example, very young children would not be exposed to news items which might either frighten them or be too complicated to really explain to them in a way they can make sense of. Equally, older children might bring topics into school which they are concerned about. Our teachers know to handle questions sensitively and if they are not sure they will seek advice. Here at Rose Hill Primary School we recognise that the personal development of children, spiritually, morally, socially and culturally (SMSC) plays a significant part in their ability to learn and achieve. We aim to ensure that a child’s education is set within a context that is meaningful and appropriate to their age, aptitude and background. We plan to give each child a range of opportunities to reflect upon, and discuss their beliefs, feelings and responses to personal experience. We want to enable children to develop an understanding of their individual and group identity. We endeavour to enable children to begin to develop an understanding of their social and cultural environment and an appreciation of the many cultures that now enrich our society. We strive to provide each child with the opportunity to explore social and moral issues, and help them develop a sense of social and moral responsibility. The children decide upon their class charter and the rights associated with these. Each class has their class charter displayed. Our School Council members are voted in at the start of each school year. Anyone wanting to be a member of the School Council must prepare and present a short speech to their class on why they believe they are the right person for the job. The class then votes for their School Council member. We also have a Chicken Committee. Their role is to ensure that our chickens are treated well: they liaise between their peers and our outdoor learning team to ensure the safety and welfare of the chickens and share ideas across the school on how to raise money for the chickens when needed. They also helped in the voting process which was needed to name the chickens. Our school curriculum also promotes democracy, by looking back, for example, to Ancient Greece. Our Y5s learn about the system of government in our country, different types of government around the world, how to canvas opinion on what people think about our school and the local area, what makes a good leader, and how to write a successful political speech. 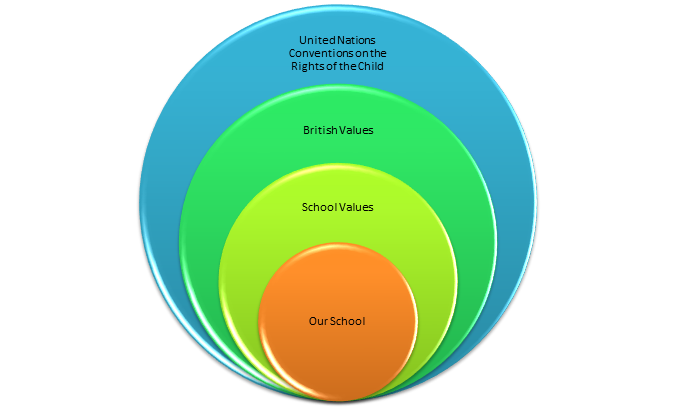 Our school values programme sets out how rights and responsibilities coexist. 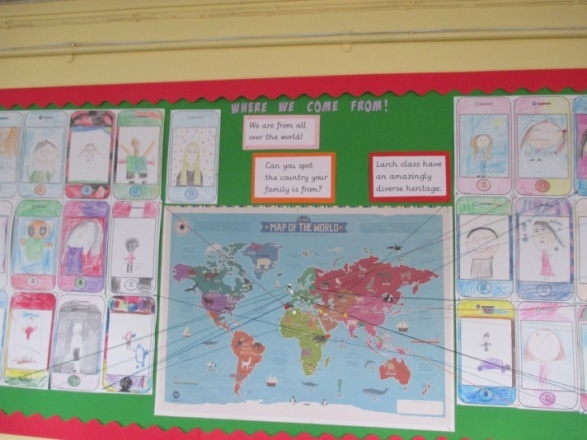 The children learn, through whole school and class assemblies, about children’s rights, rules, freedom, human rights and how some people in the world have had their rights taken away, e.g. refugees. Assemblies help the children to understand the reasons behind laws and how they govern and protect us. Keeping safe when using the internet is regularly discussed with children in computing lessons and in assemblies. All members of the school community sign our Acceptable Use Policy and pledge to use the internet safely. Children have their own freedom to make their own choices: the freedom to do what’s right, the freedom to behave and think their own individual thoughts, the freedom of speech, thoughts and actions whilst not infringing upon the freedom of others. As part of our curriculum every child takes part in Philosophy for Children. The children discuss in groups, then decide on a few questions as a class and finally one question is chosen for discussion by using an omniscient vote. The question chosen is open ended. Children respectfully challenge their own and others’ thinking and, at times, children share with the group that they have changed their own minds based on the discussion and listening to the opinions of others. Our approach to supporting behaviour is to ensure that we differentiate for behaviour and see behaviour as a form of communication. This enables children to enjoy individual liberty, as we understand that individual children, at times, will need to operate outside of the class charters. Our teaching is also differentiated to ensure all children’s needs are met. Children are offered choice in their learning and, at times, they decide on the level of challenge that they accept. Mutual respect is at the heart of our ethos and values. There are many opportunities to develop spiritual, moral, social and cultural aspects across the curriculum, for example, through RE, PE, art, music, history, geography, science and English. Children are encouraged to work in collaboration as much as possible whether in their class, with other year groups and sometimes with other schools, in drama workshops or sport events, for example. Children prepare and present assemblies on inspirational people to reflect this ethos of mutual respect, such as Nelson Mandela, Mohammed Ali and Malala Yousafzai. 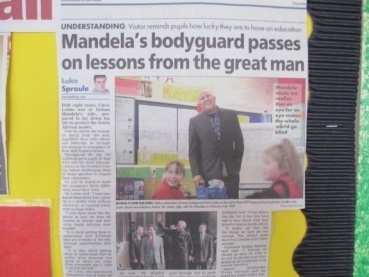 Chris Lubbe, former bodyguard to Nelson Mandela, visited our school to share with us how his education began with trips to the local rubbish tip to collect thrown-away books to read, and how he learned from Mandela to respect and forgive others. Rose Hill Primary School is an incredibly diverse community. Within our school we constantly promote tolerance of our communities, languages, faiths and beliefs through our Religious Education and Philosophy for Children syllabi. Our values-based approach supports our commitment towards a tolerant society. Members of different faiths or religions are encouraged to share their knowledge, to enhance learning within classes and the school. School trips and visitors contribute to our children’s knowledge and understanding of the world, both past and present. Children visit places of worship that are important to different faiths; for example, Y1 and Y2 visited the local church and Y5 visited the exhibition on ‘Soldiers of Oxfordshire’. Our school was invited to take part in a local radio station’s Christmas Carol Concert and our Y5s spent the morning singing carols in Oxford City centre. Our curriculum offers broad and balanced subject matter with, for example, our core English literature texts being chosen to represent different stories from around the world. Our curriculum also outlines how people live around the world and how this can be similar to and different from how we live. We ensure that stereotypes are challenged and that children receive a balanced view of the world. In a world which can be confusing and, at times, frightening, we strive to answer any questions that the children ask in a sensitive and respectful manner, balancing carefully what they need to know to keep them safe and what they need to know based on their age and stage of development. The very best interests of the children are at the heart of all we do.